The Parish of Claife is situated in the beautiful English Lake District, between Lake Windermere and Esthwaite Water. 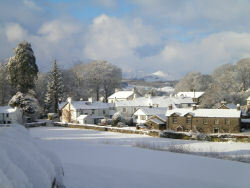 Its villages include Colthouse, Cunsey, Far Sawrey, High Wray and Near Sawrey. The Claife Parish Council web site has been set up to give Parish residents details of the Council, what it is doing and what it is discussing. It also gives access to the Council meetings’ minutes and provides details of the next Parish Council meeting so that residents can attend if they wish.